Do you support the study that states that the building and/or sites on Association Drive may be potentially eligible for the National Register of Historic Places? Or do you support the study that indicates that the site(s) are NOT eligible for listing on the National Register of Historic Places? Do you have any other comments relative to the eligibility of the building and/or office park along Association Drive for listing on the National Register of Historic Places? FCDOT ensures nondiscrimination in all programs and activities in accordance with Title VI of the Civil Rights Act of 1964 and the Americans with Disabilities Act (ADA). If you need this information in an alternate format or would like to request reasonable accommodations for persons with disabilities or limited English proficiency, contact FCDOT at 703-877-5600, TTY 711. Requests for assistance must be received at least 7 business days in advance of an event. The Soapstone Connector Project (No. 2G40-078) aims to provide a direct connection between Sunset Hills Road and Sunrise Valley Drive crossing over the Dulles Toll Road (Route 267), as recommended by the Reston Metrorail Access Group (RMAG).The project is also included in the Reston Comprehensive Plan Amendment, which was approved by the Fairfax County Board of Supervisors in February 2014. The proposed Soapstone Connector alignment is a combination of two previously evaluated alternatives and was chosen due to its advantages over the numerous alternatives studied. These advantages include benefits to multi-modal users, connectivity to Soapstone Drive, and minimization of impacts to environmentally-sensitive areas. Determine the engineering feasibility of multi-modal roadway that would provide a connection for motorists, pedestrians and bicyclists, and transit vehicles between Sunset Hills Road and Sunrise Valley Drive. Identify the most feasible alignment for the Soapstone Connector for the most beneficial multi-modal access. Based on the findings of the feasibility study, the Soapstone Drive and Sunrise Valley Drive intersection will serve as the southern end of the Soapstone Connector, while the northern end will connect to Sunset Hills Road. 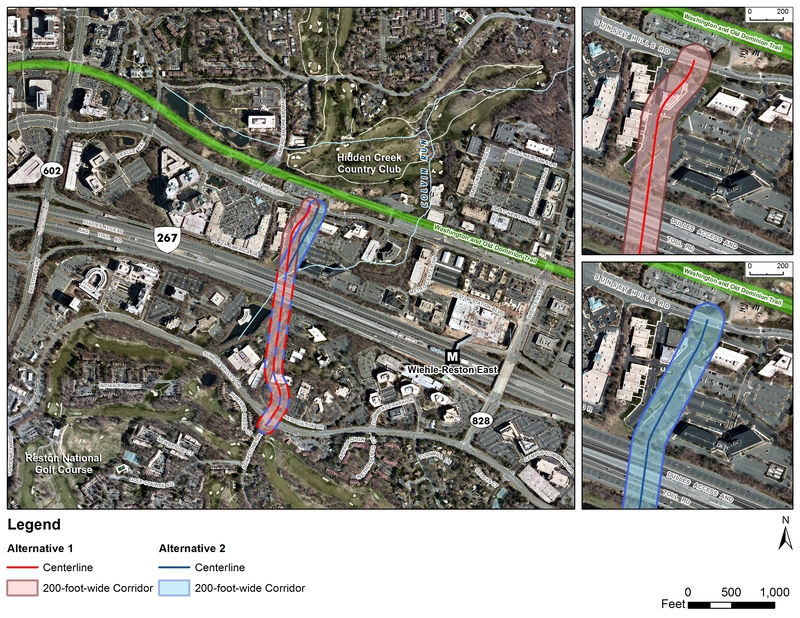 The connector will also create a new roadway and bridge that will traverse across the Dulles Toll Road and the future Silver Line Metrorail track. Three (3) travel lanes (one lane in each direction and a center left-turn only lane). A sidewalk on one side of the roadway and a shared use path on the other side of the roadway. Two (2) travel lanes (one lane in each direction). One (1) bike lane in each direction. A sidewalk on one side of the roadway and a shared use trail on the other side of the roadway. There also will be four (4) planned access points throughout the length of the roadway. Points North of the Dulles Toll Road include the intersection for Sunset Hills Road and the Soapstone Connector, and an at-grade intersection south of Sunset Hills Road. Points South of the Dulles Toll Road include an intersection north of Sunrise Valley Drive and the Soapstone Connector, and the intersection of Sunrise Valley Drive and Soapstone Drive. Some generalized environmental data was also collected in conjunction with the Soapstone Drive Feasibility Study. Some preliminary issues involve wetlands, stream impacts, business displacements & relocations, noise impacts, and cumulative and indirect impacts. A copy of that study is available for review.